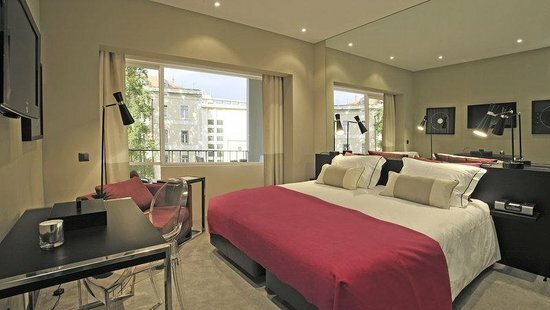 The Tivoli Jardim is a well established Lisbon hotel located in the heart of Portugal's capital. Opened in 1968 this timeless Lisbon hotel offers a full range of dining and leisure facilities guests would expect of a quality hotel in the 21st Century. Guests can enjoy superb accommodation in The Tivoli Jardim. Singles, twins and doubles are available for the convenience of visitors travelling to The Tivoli Jardim. Prices from €459 which includes a lot more than a normal city break !! The rooms have been totally renovated and cover an area of 18 m2. They have King Size and Twin Beds. All the rooms are intelligently designed and are located on the 1st to 7th floors of the hotel. With a simple, comfortable and contemporary décor, they are all equipped with an executive desk, wireless Internet access, a mini bar and an express coffee machine. LCD TVs and an armchair ensure excellent relaxation. The superior rooms have been totally renovated and cover an area of 22 m2. They have King Size and Twin Beds. All the rooms are intelligently designed and are located on the 1st to 7th floors of the hotel. The decoration is simple, comfortable and contemporary, and all have a balcony with an unimpeded view. LCD TVs, an armchair and an easy chair ensure excellent relaxation. Facilities include wireless Internet access, espresso coffee machine and LCD TV. Situated in the heart of Lisbon, the Tivoli Jardim Hotel is next to the Avenida da Liberdade and 5 kilometres from Santa Apolonia Train Station, while the Lisbon Airport is 10 kilometres away. The Torre de Belem, Jeronimos Monastery, Coach Museum, Oceanarium as well as the Parque das Nacoes are the major attractions in Lisbon.